What are your windows and doors worth? Whether you have a few or many of these openings on your home, your windows and doors are an essential part of your home’s structural integrity. Dealing with broken windows and damaged doors during extreme weather can be dangerous, and repairing and replacing them after storms can be inconvenient and costly. To prevent damage to your windows and doors during extreme weather conditions, you can purchase and install affordable roll-down storm shutters from Empire Construction & Development on your home or other building. Affordable roll-down storm shutters protect against winter storms. If you want to protect your home from gale-force winds, sleet, and freezing rain, you can use roll-down storm shutters from Empire Construction & Development to securely cover your windows and doors. Our rolling storm shutters are custom made and can be used on many types of windows and glass doors, sliding doors, and more. 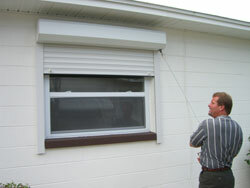 Affordable roll-down storm shutters protect against tornadoes and strong winds. High wind speeds can mean danger for your home or commercial building, especially your windows and glass doors. High winds and flying debris can crack or break your windows and create a bigger problem indoors. To protect your windows from wind damage due to tornadoes, Santa Ana winds, and other extreme wind conditions, use our durable rolling storm shutters. Rolling shutters from Empire Construction & Development are built to deflect flying objects during storms, keeping your windows intact and the inside of your home safe. Affordable roll-down shutters protect against hurricanes and tropical storms. Since these storms bring high winds and heavy rain, covering your windows and doors before a hurricane or strong tropical storm hits your area should be a priority. Our roll-down storm shutters make it easy to secure your home ahead of a storm. Forget about plywood – rolling shutters from Empire Construction & Development will be ready to go with the turn of a manual crank or the use of a motor. At Empire Construction & Development, we make storm shutters you can rely on. Contact us for a FREE QUOTE on the cost of roll-down storm shutters for your home or commercial building. Don’t risk wind and other weather damage to your property, protect your windows and doors with roll-down storm shutters from Empire Construction & Development. There are hundreds of miles of beautiful beaches along the coast of North Carolina. Tourists who prefer sand and surf to the mountains can visit North Carolina’s many coastal towns, barrier islands, campgrounds, boardwalks, and marinas every year. But tourists and vacationers aren’t all that can come to coastal North Carolina every year – hurricanes and tropical storms from the Atlantic may also pass through towns on the state’s eastern coast. Homeowners and business owners in coastal North Carolina can protect their buildings from hurricanes and other storms with accordion hurricane shutters from Empire Construction & Development. Why should you have hurricane shutters in coastal North Carolina? Hurricane shutters, like the accordion shutters designed and manufactured by Empire Construction & Development Corporation, make it easy to protect your home or commercial building in North Carolina from common types of storm damage. Windows and doors are often considered to be vulnerable areas on your home during a hurricane and can sustain damage during even a lower-category storm. High winds and flying debris may cause window breakage or cracked glass, and broken windows can then let the storm into your home. There are several ways to secure your windows against storm damage, and using our durable accordion storm shutters is one of the best ways to protect your property with storm shutters in eastern North Carolina. Our accordion hurricane shutters are made of strong extruded aluminum and installed permanently on your windows and doors. When not in use, these shutters fold clear of each opening, and whenever you need to use your storm shutters in North Carolina, you can just pull them shut. Accordion shutters from Empire Construction & Development close securely in the center and can be locked with a built-in locking device for extra home protection. Accordion shutters from Empire Construction & Development are available in four accordion shutter colors: white, ivory, beige, and bronze. Choose the color that will look best on your home, hotel, beach resort, restaurant, bar, bait and tackle shop, maritime building or other commercial or residential building in North Carolina. Our accordion shutters also make excellent security shutters for homes and other buildings in North Carolina. How can I order accordion shutters in North Carolina? 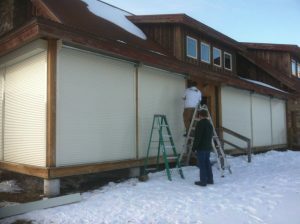 Contact us at Empire Construction & Development — we make ordering accordion shutters easy too! If you have your exterior window and door measurements, we can give you a free price quote on accordion shutters, including shipping to coastal North Carolina We manufacture accordion hurricane shutters custom to order for our customers in North Carolina and along the east coast. Check out our website, HurricaneShuttersFlorida.com, and call: 888-474-3555 to speak to a knowledgeable member of our team about your hurricane shutter order, for tips on selecting the best hurricane shutter for your home in North Carolina, or for any other storm protection questions you may have. Buy accordion shutters in coastal North Carolina from Empire Construction & Development to keep your building safe year-round. Located on Florida’s Emerald Coast, Destin, Florida’s white beaches and emerald waters attract many tourists. And hurricanes. This beautiful coastal city is situated on a peninsula that spans 100 miles through five Panhandle counties is no stranger to Mother Nature. Hurricane season begins each year on June 1st and lasts, on average, 5 months. Hurricane season peaks in August and September and Destin, Florida residents know what it takes to protect their families and property from hurricanes and tropical storms! Predicting the path and intensity of a hurricane can be very challenging. That is why it is important for anyone living or working in hurricane-prone cities, to take necessary storm-protection measures, long before hurricane season arrives. Securing your home from storm damage is a precaution that should be considered well in advance. Ordering storm shutters for your home or business is one of the best investments you can make not only for safety reasons, but because it is cost-effective over the long run. Empire Construction & Development has been selling the finest quality hurricane shutters and decorative shutters, for more than 15 years and they don’t cut corners on suppliers or parts. At their factory based in Fort Lauderdale, Florida, they manufacture several types of shutters including: hurricane, panels, energy-conserving, & security products. Because, Florida is no stranger to tropical storms and hurricanes, Empire Construction Development knows what it takes to secure homes and businesses from the wrath of these dangerous weather systems. These durable shutters offer life-time protection and are proven to increase the market value of your home or business. They are engineered using heavy-duty nylon wheels, which enable our shutters to open and close with ease. They lock securely in place for maximum protection against storms, high-winds, and forcible entry. They are a good option for windows and doors, but also for securing patios, balconies, terraces, and storefronts, which have large expanses. These sturdy panels provide the most cost-effective storm protection. They provide rock-solid durability and easy set-up. Our Storm Panels are designed to slip into an upper header track and fasten to a lower track with washer-based wing nuts. They can also be attached directly to the wall using concrete anchor and stainless-steel screws and without the need for tracks. Storm Panels have a compact design that allows for easy storage in your garage or shed. They are available in .050″ aluminum storm panels, as well as our clear polycarbonate panels. This popular shutter choice provides an elegant design solution with minimal visual impact. Our Roll Downs are constructed of the finest grade of aluminum for maximum impact resistance and durability. Using a reinforced track system and smooth, manual crank that can be upgraded to the fully synchronized electric motor, Roll Down Shutters ensure maintenance-free operation. Our Impact Rated Colonial Shutters offer convenient storm protection and an architectural flair that is reminiscent of the old south. They are constructed of heavy aluminum that is sturdy and weatherproof. Once installed, these low-maintenance storm shutters become a permanent and durable part of any house or building, providing reliable storm protection and curb appeal. Best of all, they allow for easy operation from outside the home or office. For a tropical island feel, Bahama Shutters are loved for their charming, retro appeal. But don’t let all that charm fool you. These Bahama shutters are manufactured from heavy extruded aluminum. They are permanently installed above each opening on a 45-degree angle. The design of this modern Bahama shutter allows the homeowner to see through a perforated aluminum backing positioned behind the aluminum horizontal slats, providing year-round permanent shade protection, and excellent storm protection. All of our hurricane shutters have been engineered to meet the most stringent wind codes in the country and have been reviewed and accepted by the Miami-Dade County Product Control Division, Florida Building Code, and the International Building Code. In addition to the 15+ years selling and manufacturing shutters, the Empire Construction & Development Team possesses more than 35 years of experience in design, sales, manufacturing, and construction to provide our customers the best solutions for protecting their homes and businesses. We are experts in the building industry, which enables us to deliver the highest level of customer satisfaction. 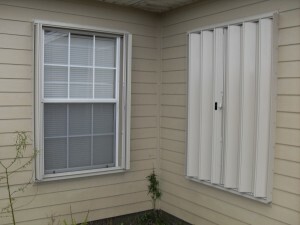 If you are ready to protect your home in Destin, Florida with the most reliable hurricane shutters, visit us at our flagship website: www.hurricaneshuttersflorida.com or call us toll free at 888-474-3555 with your window measurements to receive a FREE QUOTE on storm shutters for your home or business. We guarantee that you will have a quality experience when you choose us to safeguard your structure. Empire Construction & Development is your one-stop Hurricane Protection Resource!